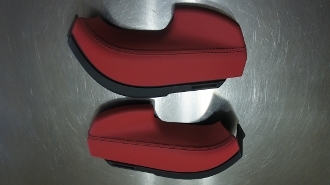 The Exclusive Option Leather Stiched Seaybelt Outlet Trim are specially made for the special 987 Spyder. The Boxster Spyder is the rareest of the 987 series and deserves every interior panel to be finished in uniformity and quality. Materials-wise everything behind or to the side of the seats are low-rate finishes. Going with the these full leather trims with deviating stitch will add some nice intricate details that will surely be noticed. The stitching matches up perfectly with the door panel seam and should have been standard from the Porsche factory.